We make a large range of tarpaulins out of the best quality materials available, with no tarp too big or too small. 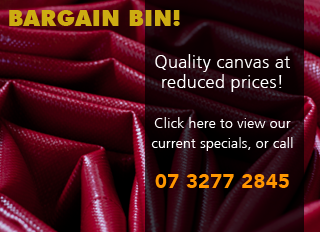 We can quote on a variety of materials including canvas, PVC, mesh, jute and poly. Eyelets are spaced according to your requirements; simply fill out our General Tarp Measure Form and fax it back to us. If you require assistance determining the best specifications for your intended use, give one of our experienced staff members a call and we'll be happy to help. Need a tarp in a hurry? We stock a range of standard tarps for 41' trailers with 5' gates (18'3" x 50') along with 45' trailers with 5' gates (18'3" x 54'). All our standard tarps have a double row of shorteners and are available in dark green and blue. Made in a 12oz premium quality rip stop (Kordux or CS12 T/S) and finished with reinforced double eyelet patches, 6mm rope rim and of course our run and fold seams. All you need to do is let us know where you would like the ropes and what brand you would like and the tarp is ready for you! For other stock items please check the spare list. The Rocklea builder's tarp comes in a large range of sizes and colours to suit your corporate identity. Made in a sturdy 670gsm PVC using reinforced eyelet patches and 6mm rim rope sewn in with a quality spur tooth brass eyelet we ensure that our builder's tarp will last so you won't be caught short when the rain comes! Order one of our standard sizes or fill out our General Tarp Measure Form for a custom size.